Our lakefront home is fully furnished with three car garage. Full deck with hot tub, gas grill and smoker (I supply the grill you supply the gas or charcoal). Washer and dryer. Cable, No smoking inside please. 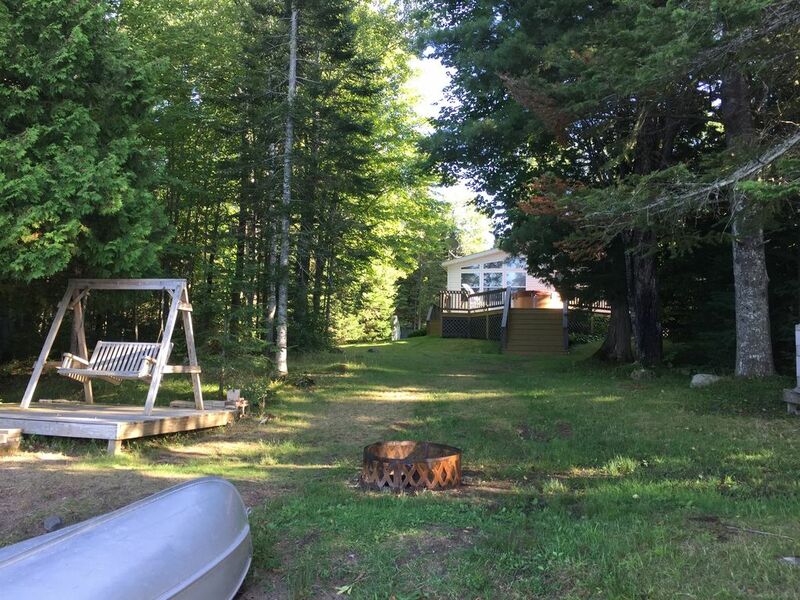 This property is only a mile from Van Riper State Park located in Marquette County. Snowmobile & ATV trails are 1/4 mile down the road. No need to trailer!! 99 miles of shoreline for the snowmobile enthusiast as well. For the summer months there is a sandy beach for swimming with the kiddos and/or docking your boat. There is a popular sand bar about 100' from our shore as well. It's a great place to relax, very wooded with nice views. Lock up your toys in the garage or rent some from The Alternative Yooper. This lake is a beauty in it's own but once you take in the bald and golden eagles you will realize your in God's Country. We have moose, bears, and dear to name a few of our neighborhood residents. Lots of fishing, Bass, Walley, Crappie, Trout and Catfish are just a few of the different fish you can catch from sitting on the rocks at the property. If your coming for snowmobiling this house is located just off the trails. No need to trailer your machines! Gorgeous place to visit and that is exactly why I and my family moved up here. Let us show you the U.P. on one of our ATV's, Snowmobile's, Jeep's or Watercrafts! Like any House Rules please be respectful to your neighbors and please don't break anything! Thank you and Have Fun! My husband is from this area but I'm from Kansas City. We moved backed up here a few years ago to start a new life. It's been quite an adventure if I do say so myself! Far enough out in the woods to have peace and quiet but close enough to town to go shopping or have a nice evening out. 300ft of water front. Boat dock available with nice sandy beach. Catch fish from the dock and cook it on the grill right there on the beach! Beautiful sunsets and amazing star gazing. There is a paddle boat that guest are welcomed to use. Near the lake and boat launch and park. Great place very big and clean. Not far from the trails. Gas station is within 5 miles. Nice comfortable house and nice location for our five person snowmobile trip. We rode sleds up from Wisconsin and did day trips from this property. Sledder friendly. Six beds. Great place, would definitely stay again. Hosted a bachelor party. It was enough space in the house, yard room, hot tub, lake front, near a few fun bars, and short drive to breweries. Maybe do something about the roller coaster toilet, ;). We had an awesome weekend here. It was a great location for traveling east or west In the U.P. The home was very clean, with plenty of room for our family. The view of the lake was beautiful. My family is already planning for next year. So glad your family had a good time. Everyone was very nice and considerate. Hope to see you again next year!